Voting at Black Colleges Could Drop 30 Percent, Can Dems Fix the Apathy? Once prized fighters in the battle for voting rights, students at America’s Historically Black Colleges and Universities dropped their guard in the 2016 elections. Voter turnout among the estimated 300,000 students at HBCUs fell nearly 11 percent from 2012 to 2016, according to a national survey by the Institute for Democracy & Higher Education at Tufts University. The decline, while consistent with a fall off among black voters of all ages in 2016, was a sharp departure. Certainly, the lower turnout reflected the absence of President Barack Obama from the Democratic ticket in 2016, a lack of enthusiasm for the new standard-bearer, Hillary Clinton, and a weakening of the longtime allegiance between the party and African-American youth. But the worst may be yet to come. If historic trends hold, Democrats could see black voter turnout drop 30 percent in 2018, resulting in 5.2 million fewer African-American voters, according to a report by the non-partisan Voter Participation Center and Democratic pollster Celinda Lake. 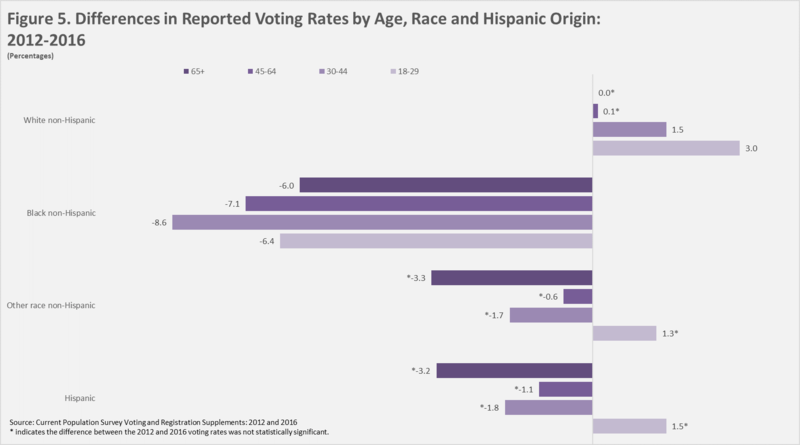 This analysis uses the NSLVE database for the 2012 election, which includes voting and enrollment information for about 8 million graduate and undergraduate students across 897 U.S. higher education institutions. We merged NSLVE data with data from other sources, such as the Integrated Postsecondary Data System (IPEDS) and the Current Population Survey. We then used ordinary least squares regression with robust standard errors to estimate the relationship between institutional voting rates and several institution-level variables, such as institution type and information about the surrounding community. Through the analysis, we identified several factors that predicted institutional voting rates, including demographics of the student body and various characteristics of the institution and of the surrounding community.